Kochi: Despite heavy rains and other obstructions, the works of the Rs 5,537 crore Kochi Metro Rail project are fast progressing and inching towards completion. While it took six years to complete the first 10-km stretch of the recently inaugurated Chennai Metro, the 18-km stretch of the Kochi Metro from Aluva to Maharaja’s will be ready in three years, by June, 2016, which will be a national record. “More than 70 per cent of civil works along reach one — the Aluva -Maharaja’s corridor — has been completed. Despite the delays in land acquisition, adverse climate and other obstructions, the works are being carried out as per schedule,” said sources at Delhi Metro Rail Corporation. In Delhi, it took four years and two months to complete the 8.5-km stretch while in Bangalore the six-km stretch from Byapanahalli to MG Road corridor was commissioned in five years. Similar is the case in Mumbai and Jaipur. A DMRC official hoped that the earlier fixed deadline of June 2016 can be met. 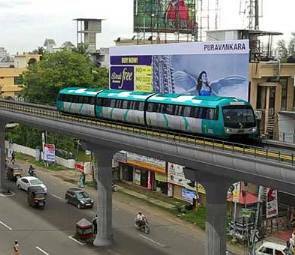 Since the contract between DMRC and Kochi Metro Rail Limited (KMRL) to complete the 25-km Aluva-Pettah corridor will end only by June 2017, the agency will get one full year to carry out the works in the remaining stretch. There are 16 stations along the first reach. “Compared to other Metros, work in Kochi is progressing very fast and can be commissioned in record time. As per the current plans, laying of imported rails over the viaduct will begin by mid-July,” added DMRC sources. After the civil work, the viaduct structure will be handed over for systems and signalling works by December. A trial run is expected to begin from January-February next year. Construction of coaches at Alstom factory in Sri City is progressing and will be delivered by December and it will take a month to assemble them.